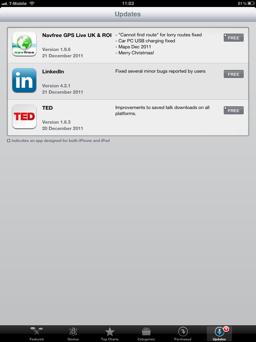 Seems that the updates section hasn't update all button. I'm wondering if this is a general issue for people or if an update was rolled out for the app store without users having to interact in any way. Anyone else having a problem with it? Carrier IQ - Is it as bad as it seems? In June I wrote a piece called "Are so many Android devices a good idea". In this article/rant because lets face it I'm no Journalist.. I spoke about the fact that you had to wait for your teleco to push operating updates to the device. Now we can see why you have to wait. This is exactly the same thing that British Telecom were trying to do with Phorm a few years ago. Where everything you did was intercepted by a 3rd party company. The Teleco's must be getting a massive kickback from Carrier IQ for the shear amount of data that they are recieving from customers. I for one am hoping that since the video shows the developer switching into USB debug mode that it is then enabling all debug information meaning that in ordinary use the device is not actually sending any information to 3rd Party companies. If we think about it this way then you could see that the code that the telecos have put in is really just for gaining debug information rather than a big brother type situation. Also the amount of information that would have been transmitted would require a serverr farm to manage. The other point to raise is that it took so long for this to be noticed and this is the main reason I think that it is only enabled in debug mode is that how many hackers are there out there that are scanning the transmissions from the devices looking for a weakness to exploit or to grab Kudos for pointing out that this is happening. I for one and I know that I am not the only one will be watching this very closely. If this is happening I assume that they will have broken snooping laws in many countries just by selling the device.